Chamber Music at the Clark concert seating is determined via lottery. The booking-by-lottery entry form for Telegraph Quartet concert seats posts here on Thursday, March 8, 2018. Lottery registration closes Thursday, March 29, 2018. Learn more about the booking-by-lottery system for securing Chamber Music at the Clark seats. Described by the San Francisco Chronicle as “…an incredibly valuable addition to the cultural landscape” and “powerfully adept… with a combination of brilliance and subtlety,” the Telegraph Quartet, originally formed in 2013, is the recipient of some of the chamber music world’s highest honors. 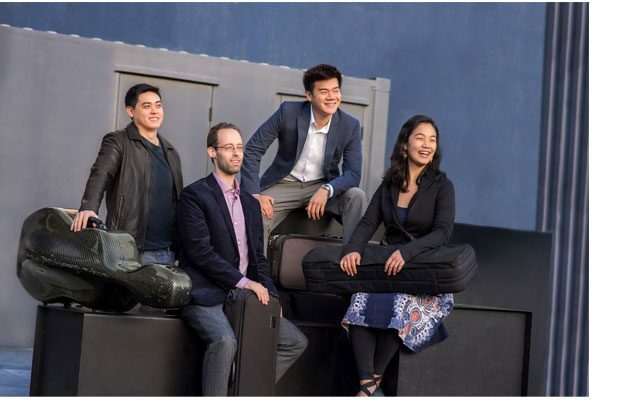 Most recently, the Quartet was the winner of the 2016 Walter W. Naumburg Chamber Music Award and the Grand Prize at the 2014 Fischoff Chamber Music Competition. The Quartet has performed in concert halls, music festivals, and academic institutions from Los Angeles and New York to Italy and Taiwan, including Carnegie Hall, San Francisco’s Herbst Recital Hall and the San Francisco Conservatory of Music, and at festivals including the Chautauqua Institute, Kneisel Hall Chamber Music Festival, and the Emilia Romagna Festival. The Telegraph Quartet recently joined the faculty at San Francisco Conservatory as Quartet-in-Residence.